The work of Meriem Bennani traverses video, sculpture, multimedia installation, drawing, and instagram. Developing films, installations and immersive environments to interlace references to globalized popular culture with the vernacular and traditional representation of Moroccan culture and history, the artist’s work is composed with humor. Bennani is interested in questioning fractured identities in contemporary society; identifying and upheaving gendered histories, through the filter of digital technologies. In 2015, she produced the first episode of Fardaous Funjab, a satire based on a reality TV show depicting a hijab designer (“funjabs”, fun hijabs) whose delirious and absurdist creations propose to Muslim women headscarves with lipstick pockets or tennis balls. Bennani ingeniously transforms an at-times controversial religious attribute into a pop-fashion accessory. In her work, she is particularly interested in exploring the relationships between women in Morocco through her female relatives. 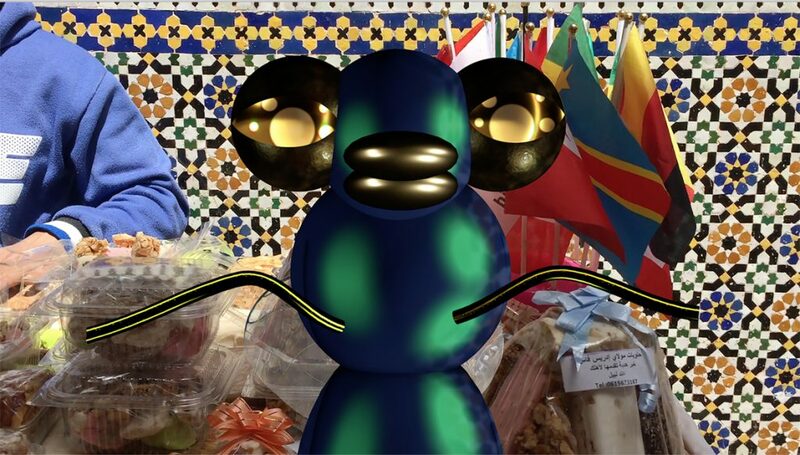 Through her sophisticated multi-layering of 3D animation, documentary film, music videos, and soap operas, her projects mimic contemporary American pop culture to contrast, merge and to manipulate Moroccan identity and culture.